Big Bend National Park is rather remote for most of us, even for those of us who live in Texas. Big Bend is about 430 miles west of San Antonio, TX taking 1-10; about 315 miles east of El Paso, TX also taking I-10; and about 540 miles south of Albuquerque, NM by US 285/385. Most travelers will leave I-10 at Van Horn or Fort Stockton and head south to the small Texas town of Alpine or the tiny hamlet of Marathon. A few, coming from the drive along the Rio Grande from Presidio, TX and perhaps a visit to Big Bend Ranch State Park on Ranch Road 170, will be entering from the west through the old mining towns of Terlingua and Study Butte. There are two entrances to Big Bend National Park: the North Entrance at Persimmon Gap which is 35 miles due south of Marathon on US 385 and the Maverick Entrance (West Entrance) which is around 100 miles south of Alpine and just 2 miles east of Terlingua on State Route 118. The park headquarters and the main visitors’ center at Panther Junction are about 6 miles east of the Maverick (West) Entrance, where US 385 from Marathon ends. Since there are many scenic attractions and information pullouts along the entrance road (US 385) from Marathon, I recommend you drive this road at least once during your visit. The driving distances are great in southern Texas and the Big Bend so try to fill up your auto or RV in Alpine or Marathon (pricy) before entering the national park. If you do run low during your adventures, keep in mind that you can buy fuel in the park only at Panther Junction, just west of the park headquarters, or to the east at the store near Rio Grande Village RV Park. Both gas stations are on State Route 118. The fall, winter, and spring are the best times to visit The Big Bend as the temperatures are very high in the summer, especially along the Rio Grande. Late summer and fall is the “monsoon” when the park gets most of its precipitation in the form of thunderstorms, but there may be light rain or even snow in the high peaks in winter. Keep in mind that Big Bend is really three national parks in one: A mountain park (5000-7900 ft); a desert park (2000-5000 ft) ; and a river park (below 2000 ft). Depending on your interests and the season, be prepared for weather that reflects these vast climactic differences. The table below is based on average temperatures at the Panther Junction park headquarters. Temperatures in the higher mountain areas vary about 5-10 degrees below those shown, while temperatures along the Rio Grande can be 5-10 degrees higher. Sunshine is abundant most of the year. Infrequent and brief periods of cloudy weather may occur during the winter months. While snow is rare and generally light, occasional cold fronts can bring temperatures well below freezing. 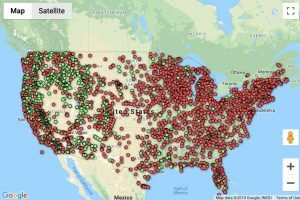 In general, your chances of finding a campground in a national park are best if you avoid weekends in high season and holidays in particular. Try to make a reservation or show up on a weekday or early Friday if you want a spot in a central or popular campground. For the smaller, quieter, and more out-of-the-way campgrounds, show up at the park early in the day and make securing a campsite your first order of business. NOTE: The busy season in Big Bend is the Christmas to New Year period at which time, according to the NPS, all campgrounds may be full. Before discussing the four developed campgrounds in Big Bend National Park, I first need to mention the many primitive camps designated by the park authorities. There are around fifty of these sites widely scattered around the park. These signed wide spots in the road can be found on most of the high clearance and 4×4 dirt roads that crisscross Big Bend. Some are only yards off the pavement and some are very remote, along very rough roads. Depending on the season, your vehicle, and your courage, you may find these primitive roadside camps more to your liking than the main developed campgrounds. Permits for these camp sites can be gotten at any of the four visitors’ centers in Big Bend NP. 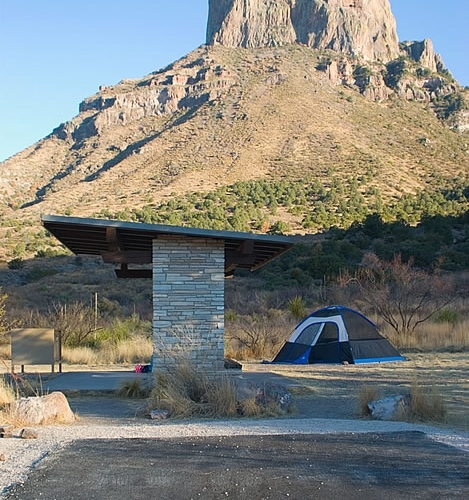 There are four developed campgrounds in Big Bend National Park. Three are run by the NPS and one is a private concession. 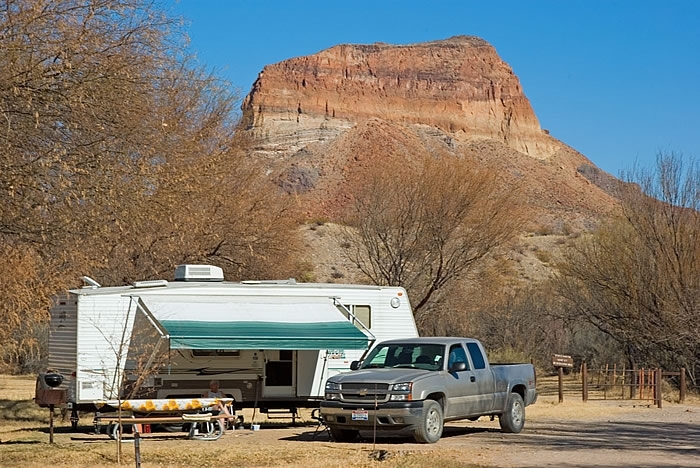 Probably the most sought after campground is Chisos Basin Campground. This moderately sized NPS campground is located at about 5,400 ft in the heart of the Chisos Mountains. As the highest and coolest and located in one of the most scenic areas of the park, this campground is one of the busiest. Some of the parks best hiking trails start near here. They lead to the parks highpoint Emory Peak or to the scenic cliffs at the South Rim. From both spots the views are unsurpassed. There are also the shorter and easier Window View and Window Trail, that starts right in the campground. And within walking distance is a visitors’ center, the lodge and restaurant, and a small store. Note that the road into Chisos basin is very steep and curvy. The NPS recommends that RVs longer than 24 ft not attempt the drive in. 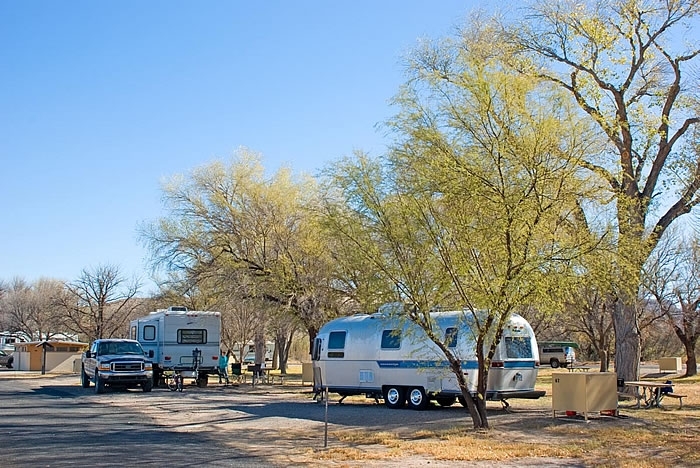 There are two campgrounds on the east side of the park at Rio Grande Village near the end of the east road (State Route 118) and right along the Rio Grande. One, the Rio Grande Village Campground, is operated by the park service. This is the largest in Big Bend and can accommodate everything from tents to the largest RVs. The sites are mostly quite large and widely spaced so the feeling is not crowded, even when the camp is mostly full. There are many trees and irrigated grasslands which add to the pleasant atmosphere. For those who want more peace and quiet, the eastern third of the campground is a no-generators zone. Local park attractions, only a short drive away, include a visitors’ center, Boquillas Canyon Trail, and the Hot Springs Historic District, where you could grab a soak. Showers, food, and gas can be had at the village store at the close-by Rio Grande Village RV Park. This is a campground operated by a private concessionaire and is a full-hookups facility. One row of mature trees separates two rows of asphalt-paved parking spaces. The store and gas station are a short walk away. On the west side of the park, at the end of the west road (Ross Maxwell Scenic Drive) and just past Castolon is Cottonwood Campground. This is a small, basic and low-key campground in which the NPS has forbidden generators. When I was there, small RVs and tents seemed to predominate; indeed, long RVs might find the gravel parking pads too short for level camping. Trees, grass and the near-by Rio Grande add to the pleasant ambiance. Local park attractions include Castolon Historic District, with the old store and a park visitors’ center, and the Santa Elena Canyon Trail. These points of interest are only a short drive away. For the 4×4 crowd, the River Road leads a rough 55 miles all the way to Rio Grande Village to the east. What to do when you get there? Above, I have mentioned some of the hiking trails and park attractions that are near the four campgrounds, but there is good auto-touring throughout the park. Enjoy the historic and geologic pullouts, and wide vistas along the north road (US 385), the east road (State Route 118), the west road (Ross Maxwell Scenic Drive), and the very steep and twisty basin road. The unpaved but well maintained Dagger Flat Road is also suitable for autos. For you campers with tougher vehicles, there is the previously mentioned River Road, plus the Old Ore Road, and the Black Gap 4×4 roads. For those of you venturing off-pavement, a check with the rangers on current road conditions is advised. Backpacking, horse riding, rafting, photography and birding are also popular pastimes in Big Bend. I hope this brief guide will aid you in planning your camping trip to Big Bend National Park. Whether you are an RVer who seeks the comfort of hook-ups or the jeeper with a tent looking for a flat spot on a dirt road, you will not be disappointed with Big Bend National Park.